What happens when you ask a blogger friend to do a post on wedding series for your blog? You not only get a detailed description of the wedding rituals, but you also get picture perfect moments captured flawlessly. I coudn't get any luckier, when Shreya of Bric-A-Brac agreed to do a guest post for So-Saree and shared the details of her special day with us. So make way for the Queen of India Kitch.. Shreya Jhunjhunwala. There is a reason why Suraj Barjatya choose Marwari Weddings as a backdrop for many of his movies. Marwari weddings really are Big Fat Indian Weddings in the true sense with their opulent outfits, grandiose decor, song and dance and the yummy, yummy food. 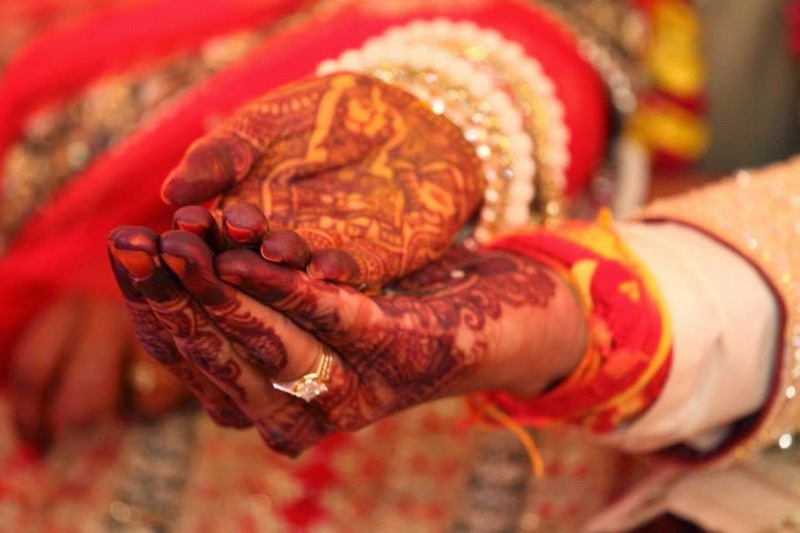 Behind the shiny facade however, the main focus of a Marwari wedding are the elaborate rituals. And there are lots of them.To summarize them all in one post would be nearly impossible for me as I do not even remember the small ones but I will try to outline the main ones that I do remember and cherish for So-Saree Readers. The wedding began with my husband arriving with his 'baraat' at the wedding venue with the traditional Band-Baaja where my immediate family was waiting to greet him and the baraatis with refreshments. My husband was given a neem stick with which he hit a small idol of Ganeshji at the top of the entrance. He then proceeded to the stage for the Varmala. My mother steps onto the stage to do his 'Aarti' and 'Tilak'. 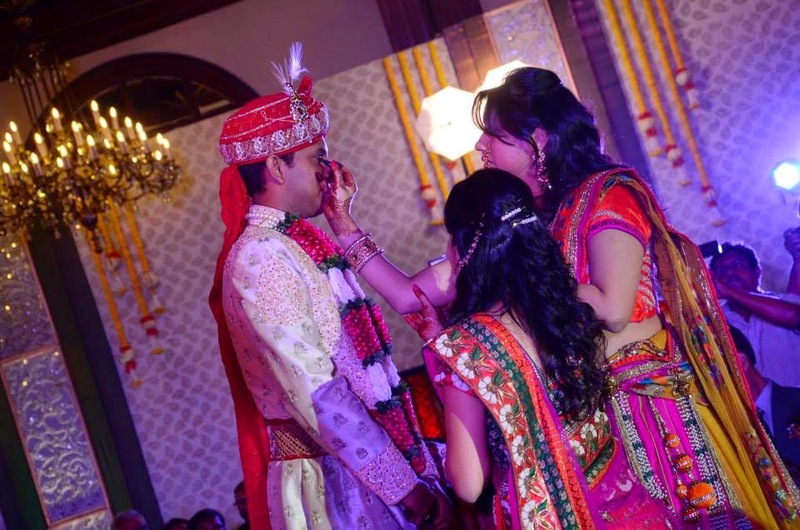 My bhabhi's then stepped onto the stage to do his tilak and apply Kohl to his eyes. After this,I am escorted to the venue under a 'Phoolon ka Chaadar'(Blanket of flowers) by my brothers and a few sisters follow. Hubby appears to be teary eyed about how pretty I look but I am later told that is the kohl which he is not used to. We exchange the varmalas in the traditional fashion which is a considerable task since I am about 5" shorter even after my heels and a higher stool. After the Varmala,we had the reception and High Tea. Traditionally, the reception happens after the wedding but mine was before as we had a later 'mahurat'(auspicious time) for the Pheras. After a lot of pictures, I had some free time so I could rest in my bridal suite while my husband started with some ceremonies where I was not required. After around half an hour or so, I was called to join my husband at the mandap for the wedding rituals. 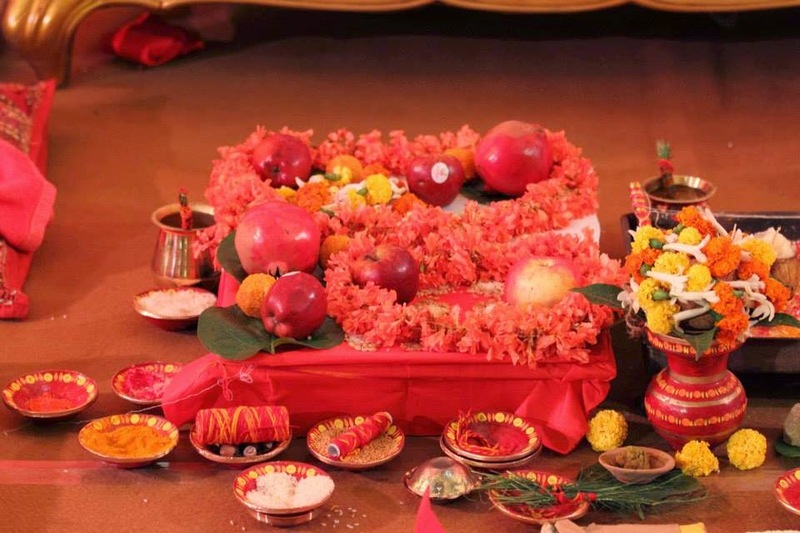 At the mandap, the 'Ganthi-Bandhan' takes place. Here,the priest ties the red cloth around my husbands waist to a chunni which is placed around my shoulders. A holy thread with a sathiya is also tied around my forehead. 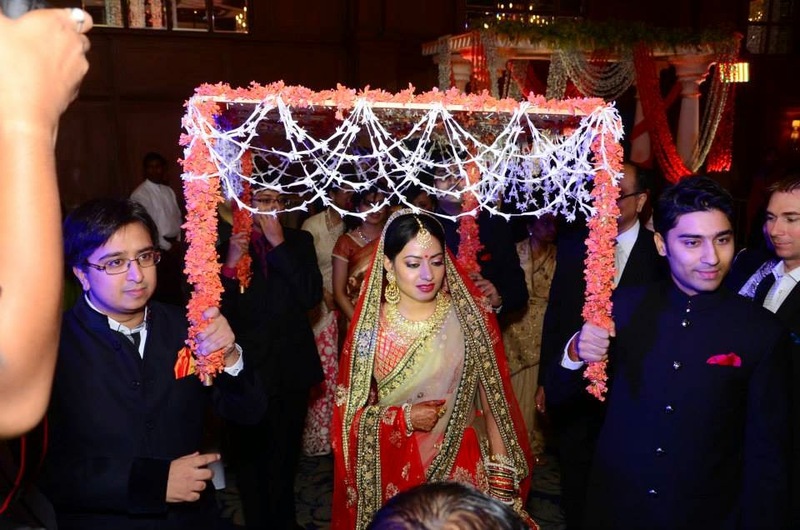 This is followed by the 'Paanigrahan' ceremony where my father places my hand over my husbands.This signifies the union of the bride and groom and the promise to always support each other through good and times. After this a cloth is placed over our hands (I guess to give our hands some 'privacy) while the priest chants some 'mantras' which we repeat after him. After this we begin the 'pheras' in which we circle the holy fire while the priest recites the mantras. 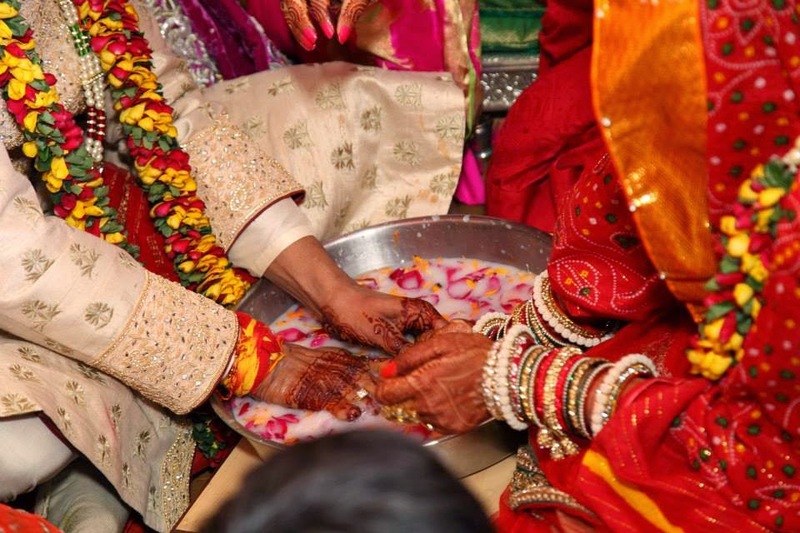 In a Marwari wedding, we have only four pheras and saat vachan.The rest three pheras are taken in different ways according to different castes. Some brides take it along with their maama(uncle) and the groom at the entrance after the varmaala, while some like me take it after they have their first child. At the beginning of each phera, my brothers pass a handful of puffed rice onto our joined hands which we offer to the fire. This symoblises the brother wish for well-being of their sister in her new life. After each phera, I put my foot over a grinding stone to symbolise the bride's courage to face the challenges of life. 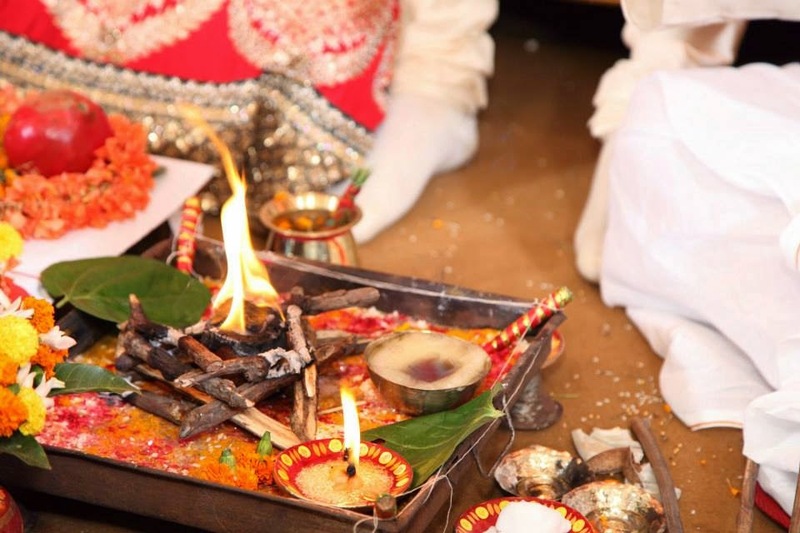 After each phera,the bride and groom make two 'vachans' other. Some of the 'vachans' are quite redundant in todays times but I have listed them for you. 1)Every woman other than than his wife will be like a sister or mother to the groom. Every man other than her husband will be like a brother or father to the Bride. 2)The Husband is supposed to take his wife along for any auspicious task and religious pilgrimages. 3)The bride is supposed and respect and care for the husbands parents like her own and groom has to care and respect the brides parents as his own. 4)The husband has to give a record of all the household finances to his wife and not spend irresponsibly. He should spend money taking in consideration the needs of the whole family. 5)It is the duty of the husband to provide for his family as It is the duty of the wife to provide for the house. 6)The husband and wife vow to raise their children with good morals and practice good moral themselves.They should welcome all guests and try to be calm and righteous. 7)After taking all these vachans, the husband asks the final vachan of the wife. He asks the wife to always follow his advice and trust in him. 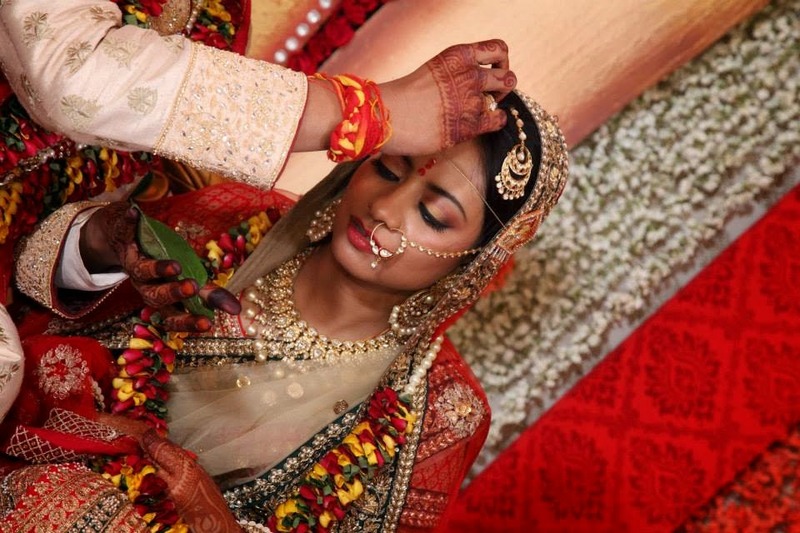 After this,the wedding is considered complete and my father performed the 'kanyadaan' or the ceremonial giving away the bride by her parents. 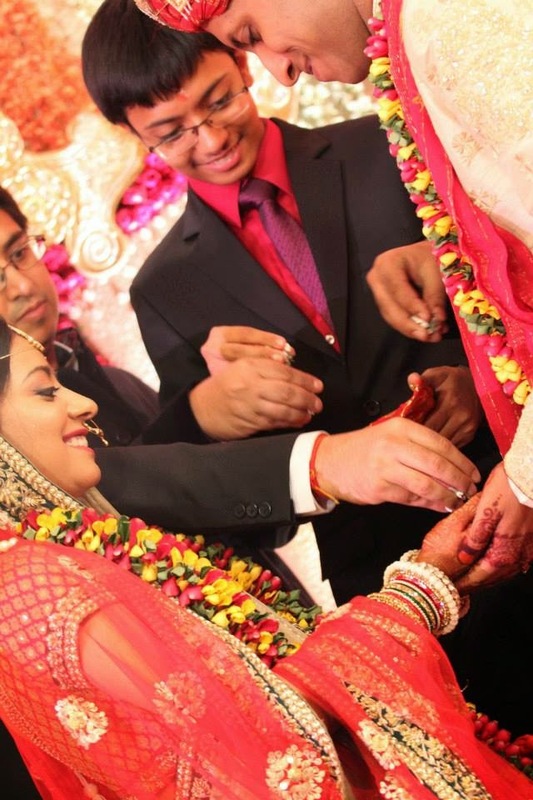 A silver coin is placed on mine and my husbands hand by my father as he offered my hand to him in marriage. I then moved over to the left side of my husband signifying the shift to his heart from my parents. The final 'Sindurdaan' ceremony is performed in which he applies 'sindur' or 'vermillion' to the center parting of my hair which the most important sign of a married woman. Some of the sindur falls on my nose which is considered very lucky but make my photos a bit funny. After a break and dinner, several smaller rituals are performed. During the 'sargunthi',my husbands buas and sisters welcome me to their family by adorning my hair and changing my 'nath'(nosering). Red and green bangles are placed in my hand by my mother-in-law. My Father-in-law gave me a pouch of 'chillad' or loose change to signify the acceptance of household responsibilities. My husband was taken to a new seat where he was given envelopes in exchange of witty compliments and quotes for the women of my family. We also play 'Jua' (Gambling) which are a few fun games to determine who will be more dominant one. There are several rituals even after we get home and in the morning but I'm assuming you have had enough of these for one post. Hope you enjoyed reading about my wedding and a huge shout-out to Aditi for letting me relive the most cherished day of my life! Thank you so much Shreya, I am so thankful to you for this wonderful post. Shreya did make for a very pretty bride!!! And marwari weddings are so lavish & royal! Thanks so much Anupriya! Your turn soon to be a very pretty bride! Feel so flattered to know that I look like a celeb! (for 1 day atleast)! For the ceremony everyone gathered in the hall of the vow renewal location. My fellow attendees and I were fortunate enough to sit in the front row. Really very beautiful collection of wedding and party wear sarees. With BullionVault you are able to obtain physical gold & silver bars at current spot exchange rates. Register your free account today and get 4 grams of free silver as a welcome bonus.